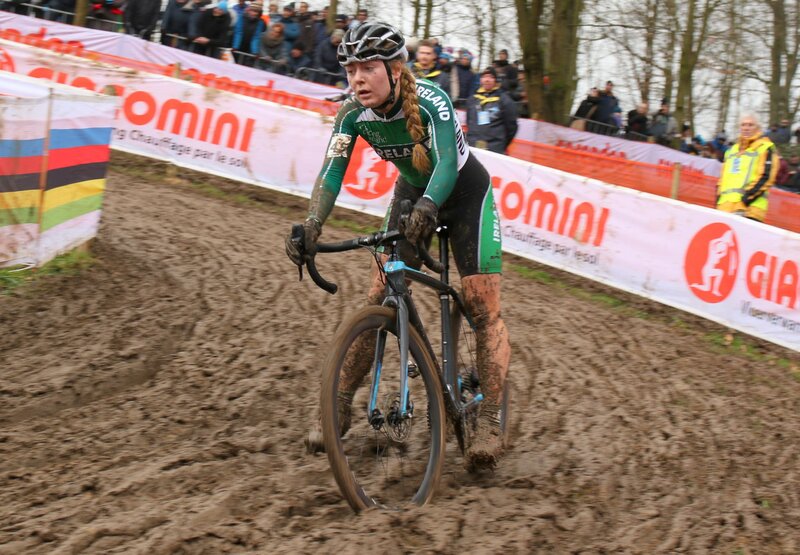 Already the elite national cyclocross champion and a medalist at the Youth Olympics, Lara Gillespie leads the Irish charge into Gent-Wevelgem tomorrow. Four Irish teenagers are riding as part of two international composite teams in the U17 and U19 versions of the Belgian classic. Gillespie and Clodagh Gallagher are in the Team Cannibal roster for the U19 edition. Alongside them in the six-rider outfit are three Dutch riders and a Lithuanian. And in the U17 Team Cannibal line-up are Irish riders Eva Brennan and Maia Simmons. There are 10 riders in the team, including three Poles. The truly international team is completed by one rider apiece from the USA, Holland, Belgium, Latvia and Lithuania. The U19 race is 71.6km and the U17 race is 43.6km. The Irish are riding thanks to the efforts of the Irish Cycle Sport International Cycling Project. It seeks to aid the development of young Irish riders, with exposure to international competition a key feature of its work. The Irish teenagers are racing on the same day the pros ride their editions of Gent-Wevelgem; adding to the sense of occasion. With fields made up of top riders from all over the world in both races, the Irish are in for a major test. Gillespie (Orwell Wheelers) has the most experience of the quartet. Despite riding as an U16 last year, she won the elite cyclocross championships earlier this year. As a result she gained selection for the U23 race at the World Championships in Valkenburg. She went on to put in a great performance, taking 23rd on the day despite being just 16-years-old. However, all four Irish riders are in Belgium to learn from racing at such a high level. And all four are formidable riders who are proven against their peers. Clodagh Gallagher (AAA Cycling), from Gaoth Dobhair in Donegal, has performed impressively on the international stage. She took the gold in the School Games in England riding for Ulster last year. She also took medals in the National Road Youth Championships last year in the TT, road race and criterium. Eva Brennan (Deenside Wheelers) took two gold medals and a bronze in the road championships last year. Maia Simmons also took two golds and a bronze at the 2017 championships, riding for The Bike House CC. Cycling Ireland has also named male Irish teams for the U23 and junior Gent-Wevelgem. Their races are also on tomorrow. In the U23 team are Daire Feeley (Monaco Union Cycliste), Conn McDunphy (Holdsworth Pro Cycling) and Darragh O’Mahony (Nogent-sur-Oise). Also picked are Adam Stenson (Speeder Cycling Team), Matthew Teggart (Team Wiggins) and Dermot Trulock (Holdsworth Pro Cycling). In the junior Irish team are the PowerHouseSport trio of Cathir Doyle, Breandan Flannagan and Adam Ward. NRPT-Chill Insurance has two riders in the team; Liam Curley and Aaron Doherty. The team is completed by PJ Doogan (Caldwell Cycles).